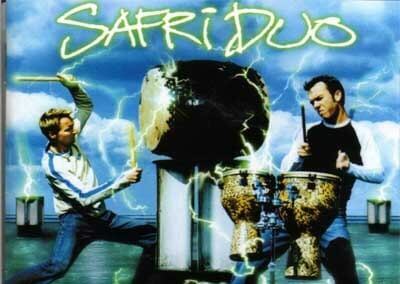 Safri Duo is a Danish electronic percussion duo composed of Uffe Savery and Morten Friis. Initially classically oriented, by 1999 they were discovered by a label executive working on classical music. After being signed, a track mixing both tribal sound and modern electronica was set to be released in 2000. The result was the popular “Played-A-Live (The Bongo Song)”, that became one of the most popular songs in Europe in 2001. 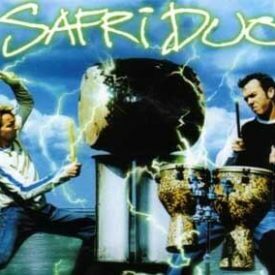 The single and subsequent album, Episode II each sold one million units worldwide, making Safri Duo the most internationally successful Danish act since Aqua. Earlier in 2000, a track named “The Bongo Song” started appearing on club’s playlists. The mix between tribal drums over trance proved to be a success, and it ended the year as one of the best selling singles in Europe in 2000 as well as featuring prominently in the opening ceremony of the 2000 Summer Olympics in Sydney. This resulted in Safri Duo guesting along with Danish pop group Aqua during the interval of the Eurovision Song Contest 2001 held in Copenhagen. “The Bongo Song” was featured prominently during the 2002 Commonwealth Games held in Manchester, England. The album, named Episode II, hit the market on 4 June 2001, nine tracks long, all featured the same percussion-electronica combination, except “Adagio” that kept the former classic line of the duo. A reissue added a second remix-only CD and the single “Sweet Freedom” recorded with Michael McDonald was released on 30 September 2002 (also “Everything” appeared in this CD Single as a B-Side). Two more tracks from Episode II were released as singles, “Samb-Adagio” and “Baya Baya”. The Bongo Song became the anthem of the world famous Coco Bongo super club in Cancun, where it is the party opening song every night. In 2003 the new album 3.0 was released. It featured Clark Anderson as vocalist on several of the tracks, including “All the People in the World”, “Agogo Mosse” and “Laarbasses”. The single “Rise” became a huge success and later they released a new version called “Rise (Leave Me Alone)” which featured Clark Anderson on vocals. In 2004 they released a remix album of 3.0 called 3.5 – International Version. It included the new version of “Rise” and several other tracks with Clark Anderson as vocalist and remixes of the already known tracks.They also played in the concert of Jean Michel Jarre (AERO Concert) on his famous track Rendez vous 4. Safri Duo’s latest album Origins was released on 17 November 2008.